Amaze friends, astonish your family, and fascinate any audience by infallibly dealing a royal flush, correctly predicting the outcome of the World Series, unmasking a psychic fraud, and performing a host of other dazzling deceptions. You can do it with the help of this book, one of the best guides to magic tricks that don't require long hours of practice or elaborate preparation. You'll find invaluable techniques - clearly demonstrated with abundant illustrations - for accomplishing magical feats with cards, coins, rope, comedy magic, mental displays of dexterity and much more, as well as expert advice for practicing psychological misdirection and dramatic presentation. Although the tricks in this book require little in the way of props, sleight of hand or a high degree of skill, the effects they produce are astounding. 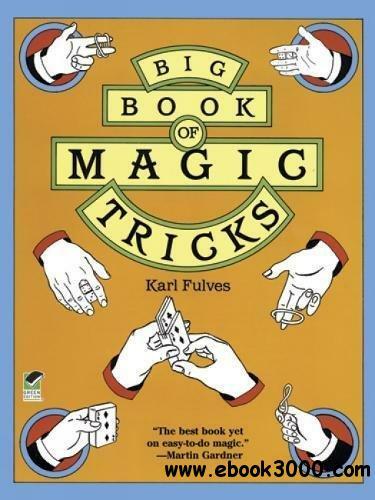 Novices especially will find Big Book of Magic Tricks a wonderful introduction to the art of conjuring but the book is crammed with so much choice new information that even professional magicians can learn something.